Picture taken right after I laid new sod. Happy One year anniversary in my house! It’s been a whirlwind and I can’t believe it has already been a year! I’ve gotten a lot done and there is still so much to do! I'll share some before and afters of the exterior since I’ve bought the house and what shape it is in today. Let me tell you it’s hard work maintaining the outside of a house! You don’t think about replenishing mulch, keeping the new sod healthy and watered, pruning the plants, keeps the porch clean, it’s a LOT of work, especially if you’re trying to DIY it. 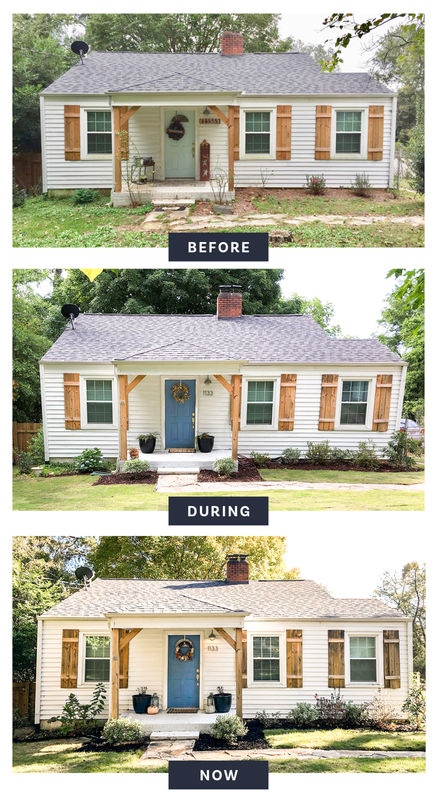 Today to kick off my first post on the blog I’m just going to be sharing the outside of the house and the stages it has gone through in the last year, as well as my plans for the future! As you can see, today the plants we put in have grown so much! I plan to prune some of these to keep them healthy and not get too overgrown. I obviously can’t keep a plant alive in those pots though so if you have any suggestions comment below! I love the fall look on the porch though! And you can also see the fencing material the previous owners used to make shutters are not holding up, so that is my next project! Here’s a little up close of the porch! I’m loving the fall vibe! Of course my dead plants aren’t the prettiest, but I finally got some lanterns to dress it up! There’s still a lot I want to do for the outside! So I’m gonna list out a couple things that I plan to do this next year to the front! Make new shutters - These ones were made with fencing wood (what!?!) so I plan to make nice and sturdy new ones that will withstand weathering and are meant to be shutters. New front door - While this one is okay, it has a hard time closing right and has an outdated window, so I look forward to replacing it soon! New Light fixture - I want something that is a little more modern and fits my aesthetic a little more. I’ve found some great ones that are super cheap you can check out here! Plants - We planted these right when I moved in, but we have ignored the sides of the house that still look overgrown and not pretty, so I plan to tear those out and replace it with a nicer looking plants and to clean it up a bit. I hope you enjoyed a little look in this last year, and I’m excited to start sharing more in depth looks into my house and my DIY projects! Comment below any projects you suggest or want to see me do outside!